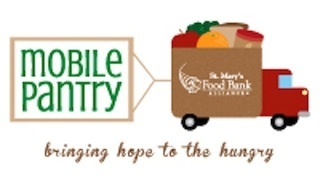 We are partnering with St. Mary's Food Bank to provide a Mobile Pantry to the community on the third Friday of each month, beginning at 8 am. Bring your own bags and stop by for fresh produce, breads, and more! Stop by the health check table for a free blood pressure check! This is not a needs-based program, just provide how many people are in your household and your zip code! We began this program in April 2013, and it has grown each month. 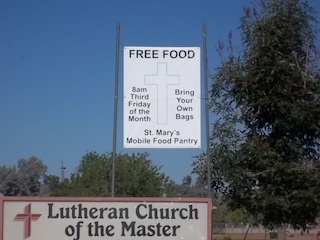 We have distributed over 6,000 pounds of food each month. We have averaged 20 volunteers from our church to help with this outreach to the community. Thanks to Safeway at 7th St and Thunderbird for kindly loaning some grocery carts each month!